These are 3 of the most worried about spiders you’re likely to see in Melbourne. They are spiders which put fear into most parents’ minds and are easily the most notorious for trips to the hospital after biting humans. We will also inform you of some simple steps to avoid spider bites. There are somewhere in the region of 12 different species of white tail spiders living in the southern half of Australia. White tail spiders are nomadic, hunter spiders that live both externally and internally. Whilst mainly external living under rocks, bark and leaf litter, they will enter internal areas of your home from spring through to autumn, living in wall cavities, roof voids, dark nooks and crannies. If you see white tails inside they tend to rest in clothes/shoes left on floors, under furniture, beds and linen cupboards. White tail spiders have cigar shaped bodies that can be grey, dark reddish brown or black in colour. They are distinctive as they have a white spot on the tip of their abdomen. They’ve got fine hairs on their legs which enable them to walk on smooth, sloping surfaces. White tail spiders are fast which enables them to catch their prey. Other spider species are the white tails favourite dish of the day including daddy long legs and red backs but black house spiders are their favourite. As white tails are ground dwelling spiders and don’t need a web to survive, actual visual sightings are normally the only way of knowing of their presence. White tail spiders aren’t aggressive but will bite if provoked. Dependant on individual reactions to their venom depends on symptoms and its severity. Symptoms include localised stinging, swelling, blistering, and vomiting. Sometimes decomposition of the skin has been reported but it’s generally bacteria on their fangs not the venom which causes this. If you’re unfortunate enough to get bitten by a white tail wash the bite site, apply an ice pack and if no improvement seek medical advice. Always try and catch the spider responsible for the bite for identification purposes. 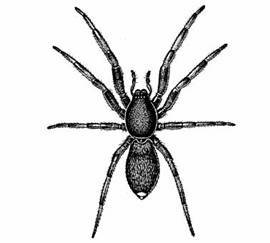 This is the most well known and seen spider in Melbourne and gives pest controllers plenty of work during the Spring – Autumn months. 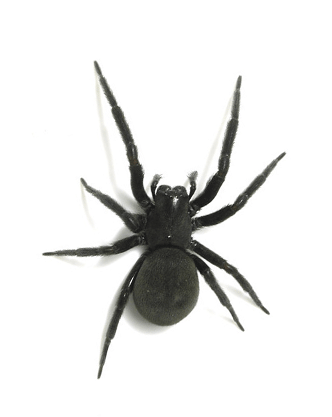 The black house spider is dark brown to black in colour and is about 15-18mm in size. They construct their webs in window frames, under pergola’s, washing lines, fence lines, under gutters, eaves and all places which are safe from weather and they feel secure. 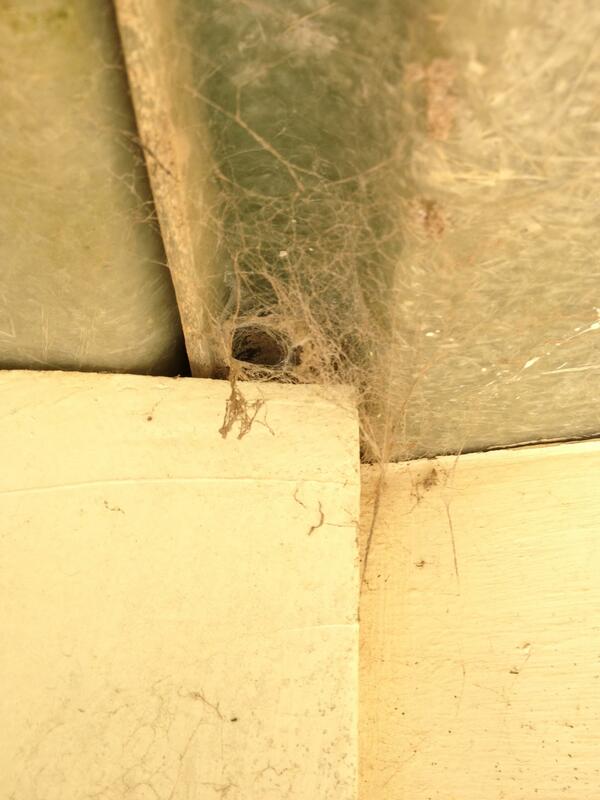 Their web is distinctive with a roughly round entrance hole. Click to view an example of their web. They are not aggressive but if they do bite will cause some pain and swelling but recovery should be swift. Medical attention should always be sought just in case of an allergic reaction. As these spiders are white tails favourite food source a treatment should be conducted to reduce the attractant for the white tail, this could save you from seeing white tails within your property and keep your family and pets safe during times of play in your garden. Red Backs belong to the same family as the Black Widow Spider and are found throughout the world and vary in danger to humans and pets. The female spider grows to approx 12-15mm with a pea shaped abdomen often with a scarlet or orange strip on it in the shape of an hour glass. Sometimes they can be totally black and be mistaken for other species. Red Back spiders favour external areas such as rockeries, logs, under shrubs, in sheds, under seating, under garden furniture, weep holes of your home and in outside toilets. They spin and live in a tangled network of silk webs, away from sunlight where it’s mainly sheltered but still warm. They mate and reproduce rapidly in warm weather. They mate twice in each breeding season with the males dying after the second time. 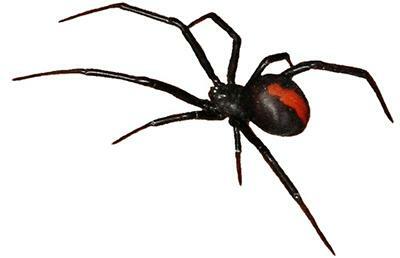 Female Red Backs can live for 2-3 years and in this time can lay many thousands of eggs in sacs. The sacs are cream in colour and can contain between 40-500 eggs (average is 100). She can produce 4-10 of these sacs. Around 500 bites are recorded each year in Australia between spring and autumn. The most likely area for a bite to occur is on the bottom or upper legs as humans wear loose fitting clothes in warmer weather and Red Backs can be found under external seating areas. In some cases the result is serious pain and illness which could require anti-venom. If a bite is suspected by a Red Back seek medical attention. Please be aware that all spiders have the ability to bite and if you’re unsure of its species you should always seek medical attention. Contact us for spider treatment details and to get an accurate price.